In last Friday’s episode of The Knick, the main character, Dr. John Thackery, worries about being upstaged at an upcoming meeting of the New York Surgical Society. Indeed, that was (and is) a real society. It met at the New York Academy of Medicine, and NYAM’s archives hold its early minute books. A portrait of Dr. Robert Fulton Weir. 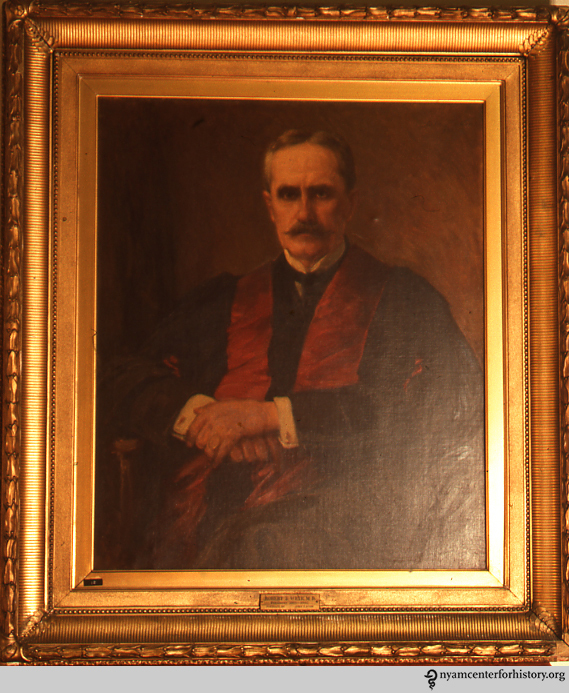 The New York Surgical Society was founded in 1879 at the home of prominent surgeon Dr. Robert Fulton Weir, later a president of The New York Academy of Medicine. By the early 20th century, membership had grown from an initial 12 members to 60. Its early founders were also instrumental in the establishment of the American Surgical Association in 1880. The surgeon on whom the Thackery character is based, Dr. William Halsted, was a member, as he worked in New York until joining the faculty at Johns Hopkins in 1889. 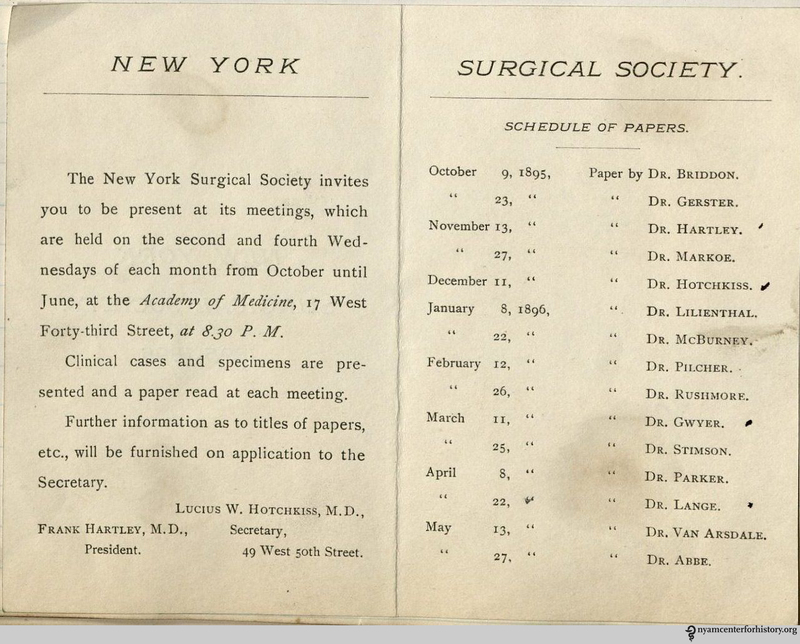 Schedule of papers in the New York Surgical Society Minutes, 1879-1897. Click to enlarge. The rise of surgical societies reflected a two-fold movement: the increasing prominence of surgery within the medical profession, coupled with increasing medical specialization overall. That is, surgery was becoming glamorous, and more and more surgeons wanted to mingle, and learn from, like-minded professionals. General medical societies date at least from the 1840s—NYAM and the American Medical Association were both founded in 1847, and the College of Physicians of Philadelphia a full 60 years before that. But in the 1870s and 1880s, specialized medical societies began to flourish, motivated by sociability and professional advancement. Presenting papers on their work, members began building a publication record and a reputation. Societies prized innovation and skill—in some organizations, priority for one’s work could be established through the minute books of the meetings, even before publication. The New York Surgical Society still exists. Find out more about it here. This entry was posted in Collections, History of medicine and tagged medical societies, new york academy of medicine, New York Surgical Society, Robert Fulton Weir, surgical societies, The Knick by nyamhistorymed. Bookmark the permalink.